Most digital oscilloscopes gain their high sampling rates by interleaving multiple 8-bit ADCs. Despite careful design, the interleaving process introduces errors that always make the dynamic performance worse than the performance of the individual ADC cores. 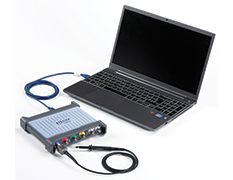 The new PicoScope 5000 Series scopes have a significantly different architecture in which multiple high-resolution ADCs can be applied to the input channels in different time-interleaved and parallel combinations to boost either the sampling rate or the resolution. In time-interleaved mode, the ADCs are interleaved to provide 1 GS/s at 8 bits (see diagram). Interleaving reduces the performance of the ADCs, but the resulting (60 dB SFDR) is still much better than oscilloscopes that interleave 8-bit ADCs. This mode can also provide 500 MS/s at 12 bits resolution. In parallel mode, multiple ADCs are sampled in phase on each channel to increase the resolution and dynamic performance (see diagram). Sampling in parallel with multiple ADCs and combining the output reduces noise and also both the integral and differential nonlinearity. Using parallel mode, resolution is increased to 14 bits at 125 MS/s per channel (>70 dB SFDR). If only two channels are required then resolution can be increased to 15 bits, and in single-channel mode all the ADCs are combined to give a 16 bit mode at 62.5 MS/s. 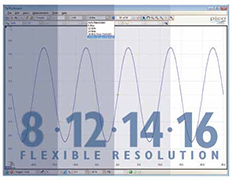 The software gives the choice of selecting the resolution or leaving the scope in "auto resolution" mode where the optimum resolution is used for the chosen settings. PicoScope 5000 series quotation today. 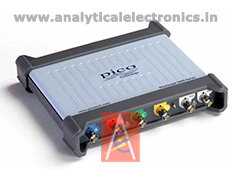 Ask for PicoScope 5000 Series detailed specification.